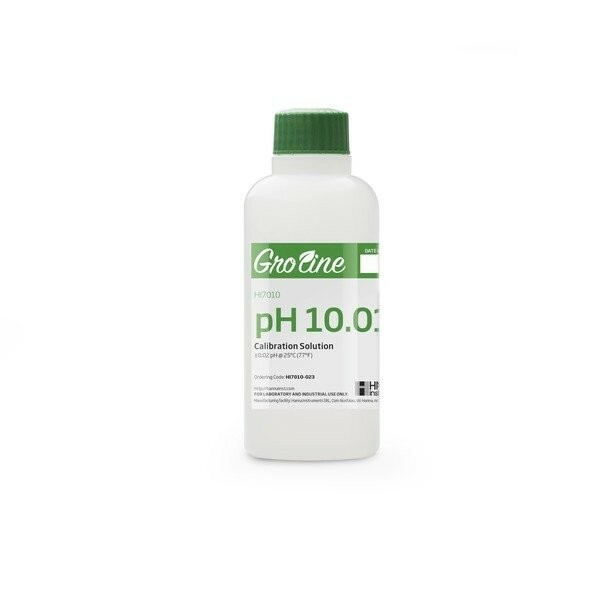 Product information "HI7010-023 HI7010-023 GroLine pH 10.01 Calibration Buffer (230 mL)"
HI7010-023 is a high quality pH 10.01 calibration buffer that is NIST traceable and supplied with a Certificate of Analysis. Hanna calibration buffers have the lot number and expiration date clearly marked on the label and are air tight with a tamper-proof seal to ensure the quality of the solution. Hanna’s line of technical calibration buffers have been specially formulated to have an expiration of 2 years from the date of manufacture for an unopened bottle. HI7010-023 is a high quality pH 10.01 calibration buffer produced in accordance with ISO 3696/BS3978 standards using high purity salts, deionized water, certified weight-checked balances, and Class A glassware in a temperature controlled environment monitored with certified thermometers. Reported values are accurate to +/- 0.02 pH @ 25°C and are traceable to NIST Standard Reference Materials (SRMs). Related links to "HI7010-023 HI7010-023 GroLine pH 10.01 Calibration Buffer (230 mL)"
Customer evaluation for "HI7010-023 HI7010-023 GroLine pH 10.01 Calibration Buffer (230 mL)"